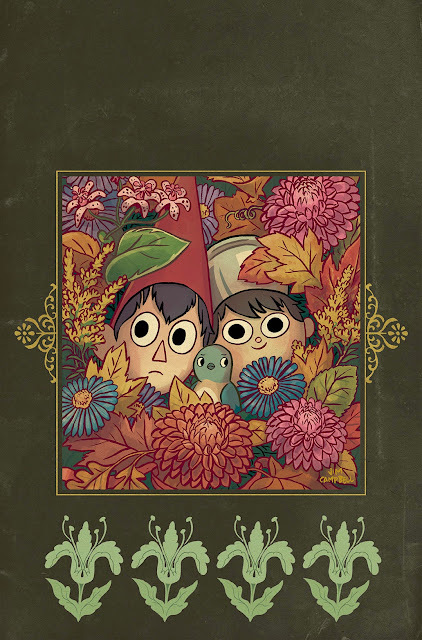 Patrick McHale and Jim Campbell will be publishing a new Over the Garden Wall mini-series this summer, under Boom's all-ages imprint, KaBoom! The 4-issue mini-series will be set set between the third and fourth episodes of the animated series, and take brothers Wirt and Greg on another adventure through the woods of the Unknown. Over the Garden Wall is a 10-episode cartoon series created by McHale, which aired on the Cartoon Network last November, as somewhat of a landmark as the network's first original animated miniseries. Centering around half-brothers Wirt and Greg (voiced by Elijah Wood and Collin Dean), the two become lost in a strange forest called the Unknown, and in order to find their way home, must travel across the apparently magic forest, with the dubious help of the is-he-friend/is-he-foe old Woodsman (Christopher Lloyd) and Beatrice (Melanie Lynskey), an irritable bluebird. 'I don’t know if most people who read it will have seen the series, but I’m sort of assuming a lot of people who are reading the comics will have, so there are certain things we can kind of give away earlier. Like maybe Beatrice can say things that will make the more knowing audience be like “Oh, that’s going to be revealed later,” and setting that up even more. I’m speaking very vague. The first issue of the mini-series is due for release in August. In other Over the Garden Wall news, Cartoon Network released the original pilot to the series, titled 'Tome of the Unknown' which I've included below for viewing ease (videos on the Cartoon Network website aren't accessible in the UK, and no doubt other countries also).